Trinity Lutheran Church, Bowmanstown, PA. Comparative texts about Pharisees & Sadducees from Josephus, Tosefta, Mishnah & Babylonian Talmud. Comparative primary texts about Purity and Social Relations (see esp "Tax Collectors Visit," from Mishnah, Midrash, Tosefta, and Babylonian Talmud. At Mahlon H. Smith's (Rutgers University) Into His Own: Perspective on the World of Jesus. The Parable of the Prodigal Son in Christianity and Buddhism, Ernest Valea, 1999. Section XXXIX, Who Is the Rich Man Who Can Be Saved? Clement of Alexandria (c 200). On Modesty, Chapter VII ff. Tertullian (c 200). "Parable of the Lost Sheep," Luke 15:1-10, Martin Luther, c. 1525. "Parable of the Lost Sheep (2)," Luke 15:1-10, Martin Luther, c. 1525. "The beginning of repentance is the acknowledging of the mercy of God, which encourages us to hope expectantly." "The parable of the prodigal son shows the nature of repentance, and the Lord's readiness to welcome and bless all who return to him." "Let no elder brother murmur at [the father's] indulgence, but rather welcome the prodigal back into the family. And let those who have been thus received, wander no more, but emulate the strictest piety of those who for many years have served their heavenly Father, and not transgressed his commandments." "An Appeal to Sinners: Luke 15:2," Charles H. Spurgeon, 1856. "It is in the present day quite fashionable for everybody to lie against what he believes, and to say he is a sinner, even when he believes himself to be a very respectable, well-to-do man, and does not conceive that he ever did anything very amiss in his life." "The Prodigal's Return," Luke 15:20, Charles H. Spurgeon, 1858. "The Approachableness of Jesus: Luke 15:1," Charles H. Spurgeon, 1868. "You may thus contrast and compare our Lord's gentle manners with those of kings, and nobles, and sages, but you shall find none to equal him in condescending tenderness." "The lessons are obvious, but how beautiful! (1) The deeper sunk and the longer estranged any sinner is, the more exuberant is the joy which his recovery occasions. (2) Such joy is not the portion of those whose whole lives have been spent in the service of their Father in heaven. (3) Instead of grudging the want of this, they should deem it the highest testimony to their lifelong fidelity, that something better is reserved for them--the deep, abiding complacency of their Father in heaven." "The Parable of the Lost Sheep," Luke 15:4-7, Charles H. Spurgeon, 1884. "If a son, then the returned sinner is his brother. Unless he, too, can welcome him, then he is the lost son." "Many Kisses for Returning Sinners; or Prodigal Love for the Prodigal Son," Luke 15:20, Charles H. Spurgeon, 1891. Living by the Word, Justo L. Gonzalez, The Christian Century, 2019. "What if we are the Pharisees?" "Prodigal Grace," Joseph Graumann, Jr., Modern Metanoia, 2019. "Prodigal grace changes lives, however freely given it is." "A Man Had Two Sons...How Will the Story End?" Janet Hunt, Dancing with the Word, 2019. "Will we allow ourselves to love more than we judge and just join in the party with all the rest?" Commentary, Luke 15:1-3, 11b-32, Sharon H. Ringe, at WorkingPreacher.org, Luther Seminary, 2016. "We tend to focus on the lavish welcome offered to and accepted by the younger son, but the story of his restoration is framed by the story of the "loss" of his elder brother." "Letters to Prodigals," Debie Thomas, Journey with Jesus, 2016. "But here's your vindication: the power in this story is yours. Your brother is inside already; it seems he's done breaking hearts for the time being. Your Father stands in the doorway, awaiting your company. You get to write his ending." A Provocation, Richard W Swanson, Provoking the Gospel, 2016. "Years ago, Donald Juel suggested a reading of this scene that recognized what older siblings have sometimes learned about younger siblings: they have the advantage of waiting, watching, and learning how to manipulate their parents." "The Beloved," David F. Sellery, 2016. "For the Son of God was eating with the very last, least, and lost souls who needed to know more than anybody that the God in heaven above whom Jesus represented was a God of generous joy who is enthusiastic about our lives and eager to throw one party after the next for every bedraggled sheep, lost coin, or lost son who shows up on the front porch of God's heart to say, "Still got room at the table for me?"" "The Prodigal God," David Lose, ...in the meantime, 2016. "... the cross is not a means of payment but rather shows us just how far our prodigal God will go to tell us of God's immeasurable love. Period." "Perspective Matters," Karoline Lewis, Dear Working Preacher, 2016. "Perspective matters, invite outside of ourselves moments -- essential for interpreting the Bible for sure, but also critical for interpreting ourselves and telling ourselves the truth about ourselves." The Truett Pulpit, Angela Reed, 2016. "The Politics of the Welcoming Father," Amy Allen, Political Theology Today, 2016. "Welcome Home!" Bob Cornwall, Ponderings on a Faith Journey, 2016. "Return," Journey to Penuel, 2016. Commentary, Luke 15:1-3, 11b-32, Andy McGee, A Plain Account, 2016. "In light of this, the question for the Church is no longer focused on getting the prodigal children back to their families but rather bringing in those who have been labelled prodigal." "Prodigals: Are We the Older Brothers or the Party Friends?" Nancy Rockwell, The Bite in the Apple, 2016. "Theologian Paul Tillich wrote in the margin of his Bible, next to the parable of the prodigal son, this comment: When the prodigal came home, I hope he didn't stay too long." "Young Man, Young Man" Lynn Miller, celebrating our creative and living God by generating art and architecture resources for congregations and individuals. Art and Faith Matters facebook page contains additional resources. "Prodigal Jesus," Andrew Prior, 2016. "A politician who was losing support started coming to church during the election campaign. There were knowing smiles at his sudden piety. And it never occurred to me, his elder brother, that perhaps he was trying to come home..."
"Two Sons: How will the Story End?" Janet H. Hunt, Dancing with the Word, 2016. "Shall we, shall I, set aside my own bitter pride and go to the party after all?" "Parable of a Prodigal Father," Glenn Monson, Law & Gospel Everywhere, 2016. Commentary, Luke 15:1-3, 11b-32, Arland J. Hultgren, at WorkingPreacher.org, Luther Seminary, 2013. "The parable leaves two themes in tension. On the one hand, Jesus illustrates the love of God that is beyond human love as commonly understood and practiced, for no typical father would act as this father does in the parable. On the other hand, Jesus addresses the parable against his critics, vindicating his message and ministry, by which he consorted with the outcast. His critics are illustrated by the behavior of the elder brother, who cannot join in the rejoicing over the lost being found." "Parables as Comedy," sermon discussion from Frederick Buechner, Frederick Buechner Blog. "I think that these parables can be read as jokes about God in the sense that what they are essentially about is the outlandishness of God who does impossible things with impossible people, and I believe that the comedy of them is not just a device for making the truth that they contain go down easy but that the truth that they contain can itself be thought of as comic." "When People You Don't Much Like Receive God's Love," Eric Barreto, ON Scripture, Odyssey Networks, 2013. "...we should recognize that more often than not we belong along the supposed righteous rather than the sinners of the world." "Prelude to a Parable," D Mark Davis, raw translation and exegesis/questions, Left Behind and Loving It, 2013. Includes overview of Karl Barth's exegesis of the Prodigal Son parable. "Preaching the Prodigal," David Lose, Working Preacher, 2013. "None of these questions need be totally resolved in the sermon. That can be hard for us to do. We prefer closure – in our stories and in our sermons." "Preparing for Joy," study guide for adults, Robert B. Kruschwitz, (other resources at) Lent, focus of "Christian Reflection," Baylor University Center of Christian Ethics, 2013. Focus article, "Preparing for Joy," Norman Wirzba. "When the Manna Ran Out," Michael Coffey, 2013. "A Prodigal Son, An Undignified Dad," Alyce M. McKenzie, Edgy Exegesis, 2013. "We too are left, at the end of the parable, not sure whether or not we will go into the banquet hall." "Sitting with Sinners," Faith Element, 2013. "God Is the Prodigal Son: Reinventing Christianity's Most Beloved Parable," David R. Henson, Edges of Faith, 2013. "God is irresponsible. Hopelessly so." Translation, Sermon Notes and Commentary, Stan Duncan, If You Lived Here You'd Be Home by Now, 2013. "In preaching on this, you might want to highlight at the beginning that the parable is more troubling and unsettling for those of us in the establishment than we like to admit." "Holy Arrogance," Rick Morley, 2013. "And we are to be practitioners of holy arrogance, and that sort alone." "Shame! God Exposes Legs!" Peter Lockhart, A Different Heresy, 2013. "We believe in a God who runs to meet us in Jesus, risking shame, exposing his legs, because love and mercy and compassion flow so deeply that the shame is more than worth." "Grace Like a Glass of Cold Water," Beth Hentschel Scibienski, 2013. Holy Textures, Understanding the Bible in its own time and in ours, Luke 15:1-3, 11b-32, David Ewart, 2013. "Grumbling about Love," Nanette Sawyer, The Hardest Question, 2013. "Jesus is so irritating, the way he loves people." "Celebrate and Rejoice," Katie Munnik, Presbyterian Record, 2013. "Some people read this passage in Luke not just as a story, but as a reflection of Jesus’ own life. He left home. He had conflicting relationship with his siblings, though his mother seemed never to close the door on him. Perhaps this is one more layer of power to this story." "Lost," Nancy Rockwell, Bite in the Apple, 2013. "Prodigal Welcome," Rev. Anne S. Howard, A Word in Time, The Beatitudes Society, 2013. "The Stories We Find Ourselves In," the Rev. Dr. Janet H. Hunt, Dancing with the Word, 2013. "Where do you find yourself in the story this time through?" Comentario del Evangelio por José Daniel Barahona Suazo, San Lucas 15:1-3, 11b-32, Working Preacher, 2013. "All the Difference," Alan Brehm, The Waking Dreamer, 2013. "We have all been 'prodigals' in one way or another, and it is the experience of God’s compassion and mercy and love that has transformed us from the inside out, and it is continuing to make all the difference in our lives until we fully become that 'new creation' that is promised by Jesus’ death and resurrection." Commentary, Luke 15:1-3, 11b-32, Matt Skinner, at WorkingPreacher.org, Luther Seminary, 2010. "The challenge lies in crafting a sermon that lets people discover newness. If we think we already know what the parable is about, or think that it only means a couple of things, then we close ourselves off to its depth." "Prodigal Son," Garrison Keillor, Word & World, 1997. At workingpreacher.org. Luke 15:1-3, 11b-32, Lent 4C, Comments (commentary) and Clippings (technical notes for in-depth study), Chris Haslam, Anglican Diocese of Montreal. "The Parable of the Dysfunctional Family," Barbara Brown Taylor, 2007. "It feels good to know who?s right, who?s wrong, and which one you are, even when that shames your father and breaks his heart, causing him to die a little right before your eyes. " "First Thoughts on Year C Gospel Passages in the Lectionary," Lent 4, William Loader, Murdoch University, Uniting Church in Australia. "The message is basic: if a parent loves that much, why can?t you think about God being like that? Why can?t you see my ministry as doing that? Notice: the father does not know the mind of the son, that he has repented, so it is not about loving people after or if they have repented." "The father is seeking to reestablish the proper relationship between himself and his older son; and as Culpepper writes: "In the world of the parable, one cannot be a son without also being a brother." [p. 304]"
"The Prodigal Son and the Country of God," David Lose, WorkingPreacher.org, 2010. "Jesus paints a picture of this world in his story of a foolish son and an even more foolish father. It is a world of unmerited grace. Counters won't understand." "God is a Loony Dad (or Mom)," Kari Henkelmann Keyl, by the way, 2010. "What would it mean for us to take this risky, boundary-less love into our lives? What grudges would we feel compelled to give up? What prejudices would start to melt? What healing of relationships might be born? What self-hatred could be disarmed and forgiven?" Lectionary Commentary, Luke 15:11-32, Frederick Haynes III, The African American Lectionary, 2009. "The party thrown for the youngest son does not take anything away from what the father has for the oldest son. The father is celebrating the fact that a family that was broken is now whole, because the lost has been found and he who was dead is now alive." "Robert Capon notes that, as the father had given his life (ton bion), the younger son squandered 'his substance' (ten ousian)." "How often are we jealous of someone?s unmerited blessing?" "The Parables of the Lost Sheep, Lost Coin and Lost Son: Gospel Analysis," Gospel Analysis, Sermons from Seattle, Pastor Edward F. Markquart, Grace Lutheran Church, Seattle, Washington. Detailed background and exegesis. "We have one brother who is the prodigal of the flesh and the other is a prodigal of the spirit. Both are loved. Both are loved deeply by God, the Father." "Hearing Parables in the Cotton Patch," study guide, Robert B. Kruschwitz, (other resources at) "Parables," Christian Reflection, The Center for Christian Ethics at Baylor University, 2006. "The Land of the Settling Sons," Peter Woods, I Am Listening, 2010. "All too often. in our life and preaching as the church we have tended to side with one or the other of the sons..."
Laterally Luke, (Luke 15:11-32) by Brian McGowan, Anglican priest in Western Australia. "Lost and Found: Stories for Sheep, Coins, and Father's Sons," exegetical notes by Peter L. Haynes. "At [the story's] end, we are left wondering what will happen now. That's precisely where we enter the picture - how will we, prodigal or faithful, respond to God's love and mercy?" Jesus Now, Lent 4C. Lectionary, study and worship resources from Faith Futures Jesus Then & Now. Kairos CoMotion Lectionary Discussion, Luke 15:1-3, 11b-32, Wesley White. "A place of conversation regarding Progressive Christianity." "From Death to Life," "The Lost Sheep," Rev. Bryan Findlayson, Lectionary Bible Studies and Sermons, Pumpkin Cottage Ministry Resources. "The natural consequence of finding grace in Christ, is that we become gracious." Lectionary Commentary and Preaching Paths (Lent C4), by Jirair Tashjian, at The Christian Resource Institute. "Since the parable ends without a conclusion, it seems that the thrust of the message is directed toward those who fall under the category of the older son. The difficulty with that is that most people in the church who listen to this parable readily identify themselves with the prodigal son: I was lost in sin, but I came back to God and He took me in." "Fourth Sunday in Lent: Luke 15:1-3, 11-32," For the Renewal of Repentance: The Lukan Texts for Lent, Gary M. Simpson, Texts in Context, Word & World, Luther Northwestern Theological School, 1992. "The elder brother in this 'parable of the elder brother' angrily refused to participate in the rejoicing. For this reason the parable is also know as 'the lost sons'. Both (!) are lost." "A Bent Tale about a Dog," William Loader, Murdoch University, Uniting Church in Australia. A canine reworking of the Prodigal Son parable. Commentary, Luke 15:1-10, David Schnasa Jacobson, at WorkingPreacher.org, Luther Seminary, 2016. "This particular pericope belongs to a complex of parables that is both unique to Luke and characteristic of Lukan theology." "Joy!" David Lose,...in the Meantime, 2016. "...what if our congregations were places of joy where we heard that God was regularly about using ordinary people like us to find others in order to create even more joy." Lost and Found, Karoline Lewis, Working Preacher, 2016. Commentary, Luke 15:1-10 | Stephanie R. Dyrness Lobdell | Co-Lead Pastor Mountain Home Church of the Nazarene | A Plain Account, 2016. "In Luke's parallel parables of the lost sheep and lost coin, addresses this same less-than charitable attitude in the Pharisees and scribes who are miffed that Jesus would sully himself by keeping company with 'tax collectors and sinners.'" "Getting Lost and Getting Found..." Janet H. Hunt, Dancing with the Word, 2016. "Can you recall being lost in such a way that the only way you could 'get found' was by someone else's action? How does your experience compare to the shepherd with the lost sheep and the woman with the lost coin?" "The Scandal of God's Welcome," Glenn Monson, Law and Gospel Everywhere, 2016. "A Sorry Excuse for a Party?" Melissa Bane Sevier, Contemplative Viewfinder, 2016. Commentary, Luke 15:1-10, Lois Malcolm, at WorkingPreacher.org, Luther Seminary, 2013. "So what happens when the sheep or the lost coin are found? Note that the verb here has to do not with forgiving but with finding." "I Know What God Looks Like," Matthew Skinner, ON Scripture, Odyssey Networks, 2013. "God looks like someone who shows patient commitment." "Lost," David Lose, Dear Working Preacher, 2013. "Which of you, Jesus asks, would go to such lengths to search and find and then welcome back and celebrate? Truth be told, none of us would. But God would." "When our sacrifice rejects the one-dimensional claim that the world is flat and embraces God's journey of mercy for all human beings and all creation, then God renews our discipleship day by day and the heavens constantly celebrate our struggle to resist living like fools." "The Overlooked Woman and Her Overlooked Coins," Lauren F. Winner, The Hardest Question, 2013. "God's Foolish Adventures and the Joy of Heaven," Bob Cornwall, Ponderings on a Faith Journey, 2013. "God's Lost and Found," Stephen Lang, Upper Room Books, 2013. Holy Textures, Understanding the Bible in its own time and in ours, Luke 15:1-10, David Ewart, 2013. "Lost and Found," Janet Hunt, Dancing with the Word, 2013. "What do the shepherd and the woman have in common? Who do you know who demonstrates those characteristics? What characteristics do they share with God?" "Lost and Found," Alyce M McKenzie, Edgy Exegesis, 2013. "There is a lot that can show up in the lost and found box of your life lying in there unclaimed while you go about your ministry. It's possible to lose a lot of things and keep on keeping on." "Nobody Does This," Rick Morley, 2013. "The God of the One Percent," Andrew Prior, 2013. "One Lost Sheep," sermon discussion from Frederick Buechner, Frederick Buechner Blog. "I think that these parables can be read as jokes about God in the sense that what they are essentially about is the outlandishness of God who does impossible things with impossible people." Commentary, Luke 15:1-10, Greg Carey, at WorkingPreacher.org, Luther Seminary, 2010. "Luke 15:1-10 launches an extended reflection on one of the most provocative aspects of Jesus' ministry, his companionship with tax collectors and sinners." Luke 15:1-10, Proper 24C, Comments (commentary) and Clippings (technical notes for in-depth study), Chris Haslam, Anglican Diocese of Montreal. "First Thoughts on Year C Gospel Passages in the Lectionary," Pentecost 17, William Loader, Murdoch University, Uniting Church in Australia. "The love was unconditional. But it was also very challenging, because he was also inviting them as valued people to become part of the future vision." "The main verb in the second conclusion (v. 10) is ginetai a present = "There is". So, when a sinner repents, at that moment there is joy in heaven. Will there be joy on earth, then seems to be Jesus' question." The Parable of the Lost Sheep, audio telling, story in episodes, graphic, audio and written commentaries. Go Tell Communications, Biblical Storytelling for the Global Village, 2010. "Broken Hearts, Broken Communities," Nanette Sawyer, The Hardest Question, 2010. "Does God Grieve Losing Us Like We Grieve Losing Loved Ones?" "Tony Tony, Turn Around," Alyce McKenzie, Patheos, 2010. "We are in the business of helping people find lost items. Isn?t that in our job description?" "Signs, Sheep and Shepherds," Kyle Childress, The Ekklesia Project, 2010. "In this world of Caiaphases, the church is called to be a Good Shepherd people." "Don't Let Jesus Manage Your Money," Paul Bellan-Boyer, City Called Heaven, 2010. "What?s a sheep worth anyway? Before you risk the 99, you?d better know what the one is worth." "Care and Joy," Mary Hinkle, Pilgrim Preaching, 2004. "That everything-in-its-place kind of responsibility is not what these searches are about. Instead, the search of the shepherd and the woman are all about joy, a joy that overflows into the cheerful disarray of a celebration." Dylan's Lectionary Blog, Proper 19C, 2004. Biblical Scholar Sarah Dylan Breuer looks at readings for the coming Sunday in the lectionary of the Episcopal Church. "If one sheep is with the shepherd and ninety-nine aren't, who's really the stray?" Laterally Luke, (Luke 15:1-10) by Brian McGowan, Anglican priest in Western Australia. Wellspring of the Gospel, Ordinary 24, Catherine McElhinney and Kathryn Turner, Weekly Wellsprings. Aus, Roger David, "Luke 15:11-32 and R. Eliezer Ben Hyrcanus's Rise to Fame," Journal of Biblical Literature, 1985. Brueggemann, Walter, "'Until'...Endlessly Enacted, Now Urgent," Journal for Preachers, 2003. Burke, Trevor J., "The parable of the Prodigal Father," Tyndale Bulletin, 2013. Carlston, Charles E., "Reminiscence and Redaction in Luke 15:11-32," Journal of Biblical Literature, 1975. Chance, J. Bradley, "Luke 15: Seeking the Outsiders," Review & Expositor, 1997. Cloete, G.D., and D.J. Smit, "Rejoicing with God..." Journal of Theology for Southern Africa, 1989. Crossan, John Dominic, "A Metamodel for Polyvalent Narration," Semeia, 1977. Duff, Nancy J., "Luke 15:11-32, Between Text and Sermon," Interpretation, 1995. Durber, Susan, "The Female Reader of the Parables of the Lost," Journal for the Study of the New Testament, 1992. Evenrud, Jerry A., "Visual Exegesis, 'The Prodigal Son'," ARTS, 1992. Forbes, Greg, "Repentance and Conflict in the Parable of the Lost Son (Luke 15:11-32)," Journal of the Evangelical Theological Society, 1999. Geddert, Tim, "The Parable of the Prodigal: Priorities (Luke 15:11-32)," Direction, 1995. Giblin, Charles Homer, S.J., "Structural and Theological Considerations on Luke 15," The Catholic Biblical Quarterly, 1962. Grieb, A. Katherine, "The Real Prodigal," The Christian Century, 2004. Harrill, J. Albert, "The Indentured Labor of the Prodigal Son (Luke 15:15)," Journal of Biblical Literature, 1996. James, Ann, "Prodigiously Lost and Found," The Christian Century, 1989. Jancoski, Loretta, "Empowering Women to Claim their Inheritance," Religious Education, 1987. Keillor, Garrison, "Prodigal Son," Word & World, 1997. Langer, Heidemarie, "Letting Ourselves Be Found: Stories of a Feminist Spirituality," Ecumenical Review, 1986. Long, Thomas G., "Surprise Party," The Christian Century, 2001. Marshall, Christopher D., "Offending, Restoration and the Law-Abiding Community: Restorative Justice in the New Testament and in the New Zealand Experience," Journal of the Society of Christian Ethics, 2007. Mason, George, "You Can Go Home Again," Journal of Family Ministry, 1990. Matera, Frank J., "Jesus' Journey to Jerusalem (Luke 9:51-19:46): A Conflict with Israel," Journal for the Study of the New Testament, 1993. Mendenhall, Maury, "Runaways," Journal for Preachers, 2001. Sermon. Menken, M.J.J., "The Position of SPLANCHNIZESTHAI and SPLANCHNA in the Gospel of Luke," Novum Testamentum, 1988. Orndorff, Jan Riehl, "What about the Older Brother?" Brethren Life and Thought, 2005. Sermon. Parsons, Mikeal C., "The Prodigal's Elder Brother: The History and Ethics of Reading Luke 15:25-32," Perspectives in Religious Studies, 1996. Price, James L., "Luke 15:11-32, Expository Article," Interpretation, 1977. Ramsey, George W., "Plots, Gaps, Repetitions, and Ambiguity in Luke 15," Perspectives in Religious Studies, 1990. Reid, Robert Stephen, "On Preaching 'Fictive Argument': A Reader-Response Look at a Lukan Parable and Three Sayings on Discipleship," Restoration Quarterly, 2001. Sanders, Beth, "Winning Situation," The Christian Century, 2007. Scott, Bernard B., "The Prodigal Son: A Structuralist Interpretation," Semeia, 1977. Sellew, Philip, "Interior Monologue as a Narrative Device in the Parables of Luke," Journal of Biblical Literature, 1992. Simpson, Gary M., "For the Renewal of Repentance: The Lukan Texts for Lent," Word & World, 1992. Taylor, Barbara Brown, "The Evils of Pride and Self-Righteousness," The Living Pulpit, 1992. Taylor, Barbara Brown, "Table Manners," The Living Pulpit, 1998. Tolbert, Mary Ann, "The Prodigal Son: An Essay in Literary Criticism from a Psychoanalytic Perspective," Semeia, 1977. Via, Dan O., Jr., "The Prodigal Son: A Jungian Reading," Semeia, 1977. Wardlaw, Theodore J., "In Defense of the Older Brother," Sermon, Journal for Preachers, 2002. Wittig, Susan, "A Theory of Multiple Meanings," Semeia, 1977. Anderson, Garwood P., "Seeking and Saving What Might Have Been Lost: Luke's Restoration of an Enigmatic Parable Tradition," The Catholic Biblical Quarterly, 2008. Copeland, Jennifer E., "Clean Sweep," The Christian Century, 2004. Ross, Art, "Luke 15:1-10, Between Text and Sermon," Interpretation, 2007. Russell, Keith A., "Hungering for God: Reflections on the Lectionary Readings for March," The Living Pulpit, 2007. Schertz, Mary H., "God's Party Time," The Christian Century, 2007. Sterne, Martha P., "Seeking the Lost Sheep," The Christian Century, 1998. Walls, A.F., "'In the Presence of Angels' (Luke 15.10)," Novum Testamentum, 1959. "Room at the Table," the Rev. Dr. James Barnette, Day 1, 2013. "The Day God Ran," the Rev. William Flippin, Jr., Day 1, 2013. "Parables as Comedy," Frederick Buechner, Buechner Blog. "No Strings Attached," sermon illustration/story by Steve Goodier, Life Support System, 2013. "Quitting Ain't An Option!" (Luke 15:8-10) the Rev. Dr. Leslie Holmes, Day 1, 2007. "Rejoice with Jesus!" Pentecost +16 (Luke 15:1-10), 16 September 2007, Walter W. Harms, Goettinger Predigten: Every Sunday Sermons based on the RCL by a team of Lutheran theologians/ pastors. "Which Comes First: Grace or Repentance?" the Rev. Dr. Robert Dunham, Day 1, 2010. "God's Promises for You: I Love You," (Luke 15:8-10) the Rev. Allen Hunt, Day 1, 2007. "Arriving Where We Started," Pastor Nathan Mattox, First United Methodist Church of Morris, Oklahoma. "Is There Joy in God's House?" the Rev. Dr. Thomas G. Long, Day 1, 2004. "The Prodigal Son," Pastor Edward F. Markquart, Grace Lutheran Church, Seattle, Washington. "The Lonely Lady of Blairstone Park," story by Professor Richard Jensen. Pastor Edward F. Markquart, Grace Lutheran Church, Seattle, Washington. Sermons from Seattle. "The End of All Exploring," the Rev. Dr. James C. Howell, Day 1, 1996. "I Have Sinned," sermon by Peter L Haynes, linking "Good Will Hunting" with the Prodigal Son parable. "Who's That In the Distance?" thre Rev. Francis Miller, Day 1, 2001. "Lost and Found," Pastor Edward F. Markquart, Grace Lutheran Church, Seattle, Washington. 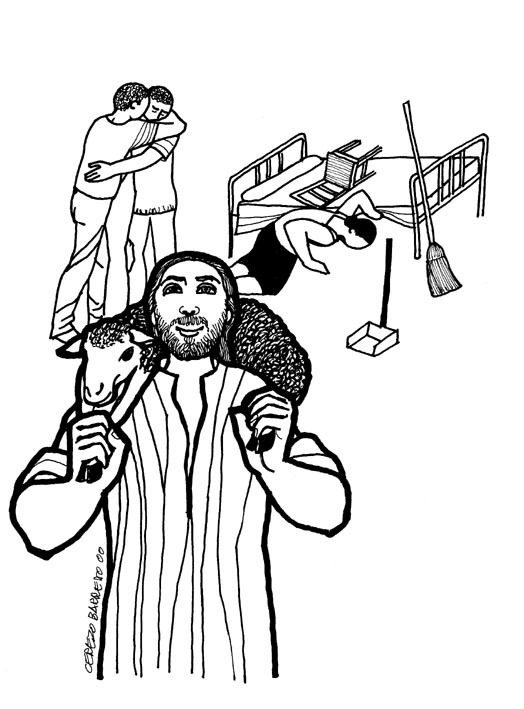 "The Lost Sheep," "The Prodigal Son," Illustrating the Story (lessons, children's sermons), coloring pages, activity sheets, crafts, children's songs. MSSS Crafts. "Wearing His Brand," "The Lost Sheep," "Three Wishes," Charles Kirkpatrick, Sermons4kids.com. "Bad Boy," Jim Kerlin, childrensermons.com. "Missing!" Linda Edwards, The Children's Chapel. "The Prodigal Son," Linda Edwards, The Children's Chapel. "A Father Welcomes a Lost Son," "Jesus Carries the Lots Sheep Home on His Shoulders," Sunday School Lessons: Family Bible Study, art projects, music, stories, etc. "The Prodigal Son," children's study, puzzles, coloring sheet, etc. Higher Praise Christian Center. Luke 15 Crossword, Don Crownover's Bible Puzzles. "The Parable of the Lost Coin," online computer java-based coloring pages from Grace Baptist Church of Feeding Hill. "Perfection," J'son M. Lee, dramatix. "Bob the Hamster," Dave Taylor, dramatix. "The Parable of the Lost Daughter," Andy Lund, dramatix. "Prodigal Bus Boy," Glenn A. Hascall, dramatix. "Come Home, Son," Lucy Hawkins, dramatix. "My Father's Will," Eric Stapleton, dramatix. Clip Art, Luke 15:6, Luke 15:9, Luke 15:20, Fr. Richard Lonsdale, Resources for Catholic Educators. Clip Art Images: Luke 15:1-10, Luke 15:1-10 #2, Misioneros Del Sagrado Corazón en el Perú. Clip Art Images: Luke 15:11-32, Luke 15:11-32 #2, Misioneros Del Sagrado Corazón en el Perú. Luke 15:11-32, Luke 15:1-32 at Cerezo Barredo's weekly gospel illustration. Liberation emphasis. 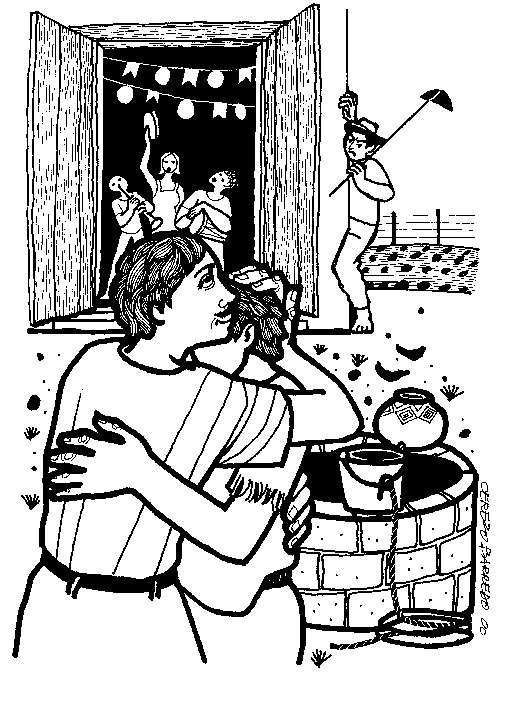 Clip Art: The Return of the Prodigal Son, Julius Schnoor von Carolsfeld woodcuts, World Mission Collection, Wisconsin Evangelical Lutheran Synod. Commercial Site: "Prodigal Daughter," visual liturgy, The Work of the People. God's Great Love is So Amazing original hymn by Carolyn Winfrey Gillette on Jesus' three 'lost and found' parables in Luke 15. Tune: CONVERSE 8.7.8.7.D ('What a Friend We Have in Jesus'). This hymn is in Sing the Faith: New Hymns for Presbyterians. Hymns with Scripture Allusions: Luke 15:2, 6, 10, 17, 18, 20, 21, 24. The Cyber Hymnal.